One of the best parts of the IG plant community? 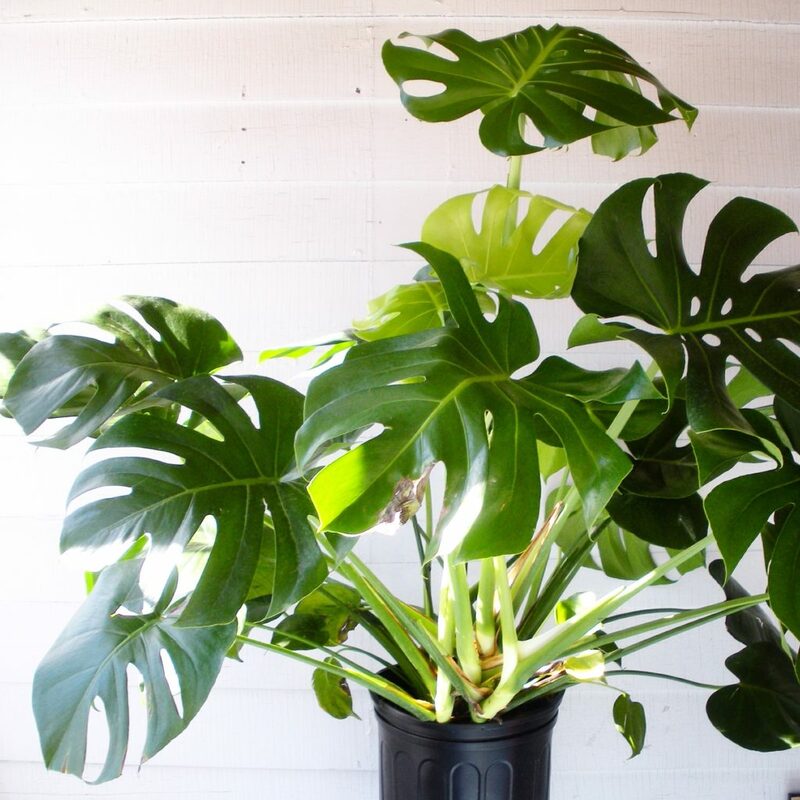 #Monsteramonday, featuring the lush and exotic Monstera Deliciosa. 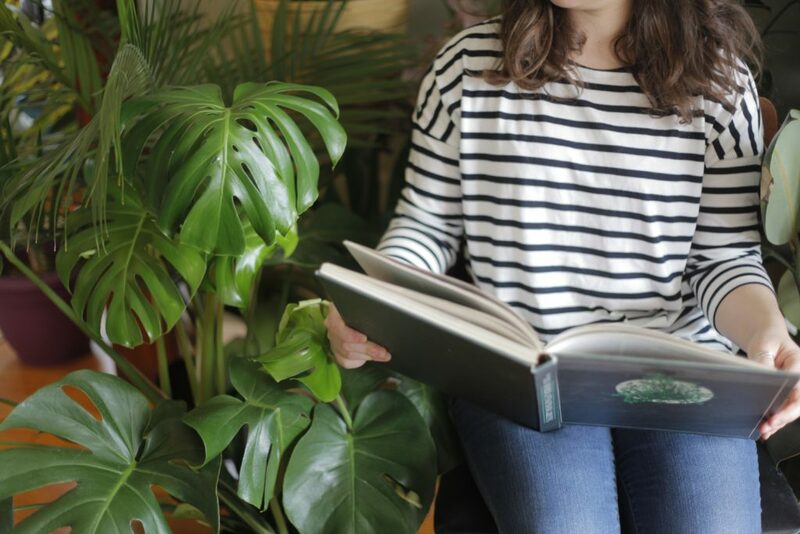 Out of all the social media platforms, Instagram is the best for plant lovers. Once Leaf & Paw was born I was excited to create its own account. First off, every Monday is #monsteramonday. IGers present luxurious photos of these giant Jurassic Park plants that I had never seen before. Maybe it’s just NY, but Monstera Deliciosa, also called the Swiss Cheese Plant, was not a common one. After seeing photo upon photo of green deliciousness (get it? like “deliciosa”), I had to have one of these. Since they were scarce in NY, I was shocked, SHOCKED that weeks later I saw one, ONE in Wegmans for $15. It was fate since I have never seen one there again. I know the garden faeries left it just for me. Now I have one of these monsters (get it? 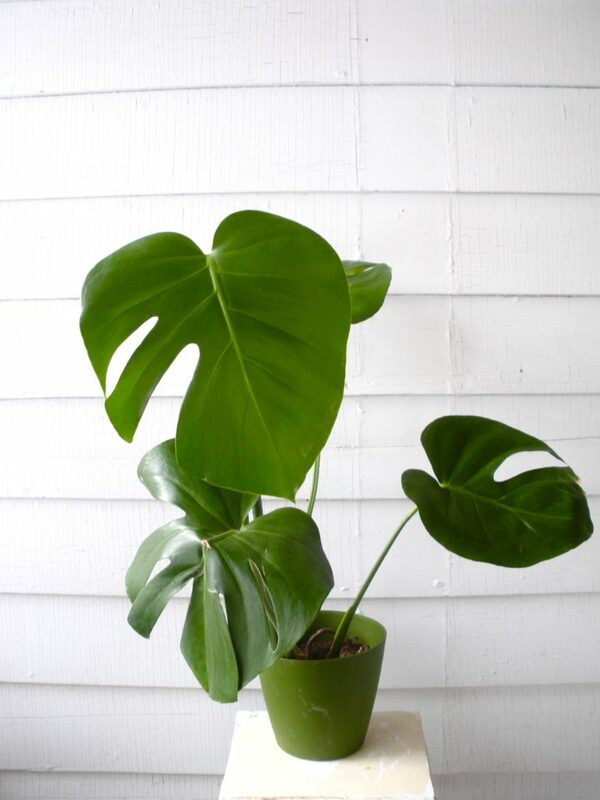 like “monstera”) it has ultimately become my favorite plant child. I named him Monty. 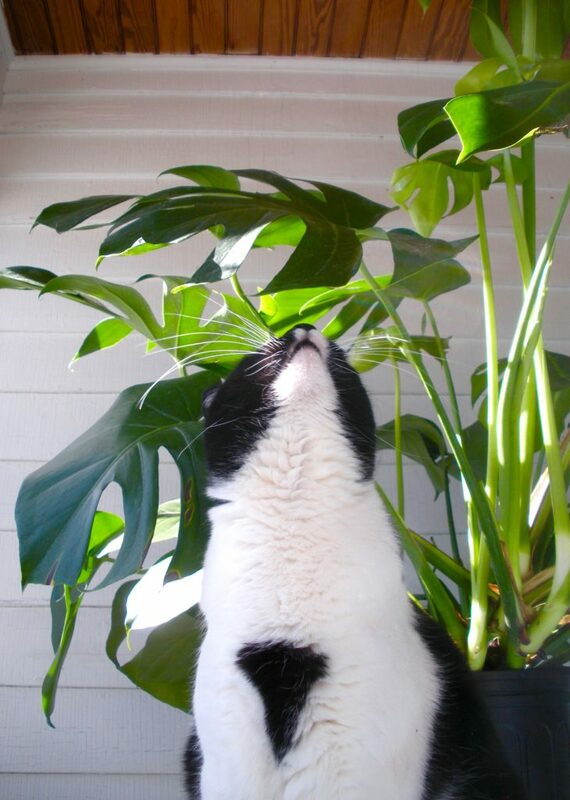 Once Leaf & Paw (and Monty) became active in #monsteramondays and I was surprised to receive a message asking why I own a toxic houseplant in a house of cats, despite my blog being safe plants for pets. Makes sense, so I’ll clear the air. 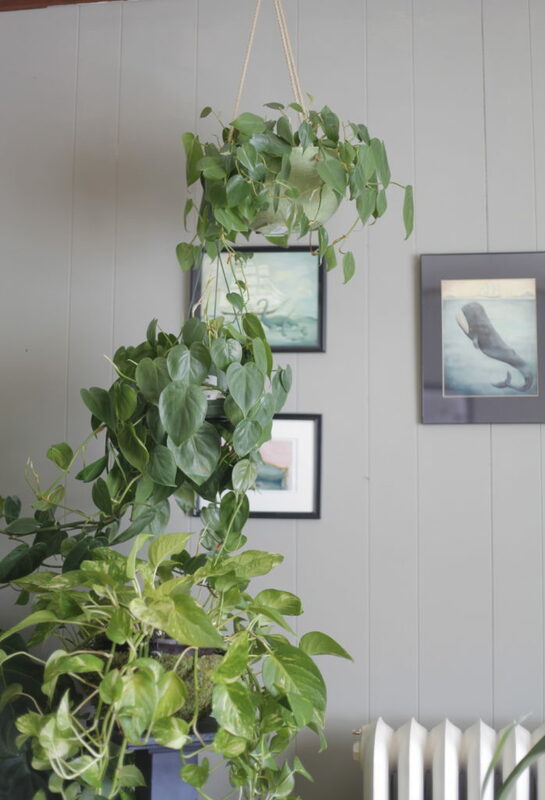 Monsteras are philodendrons – which is a vast plant group. 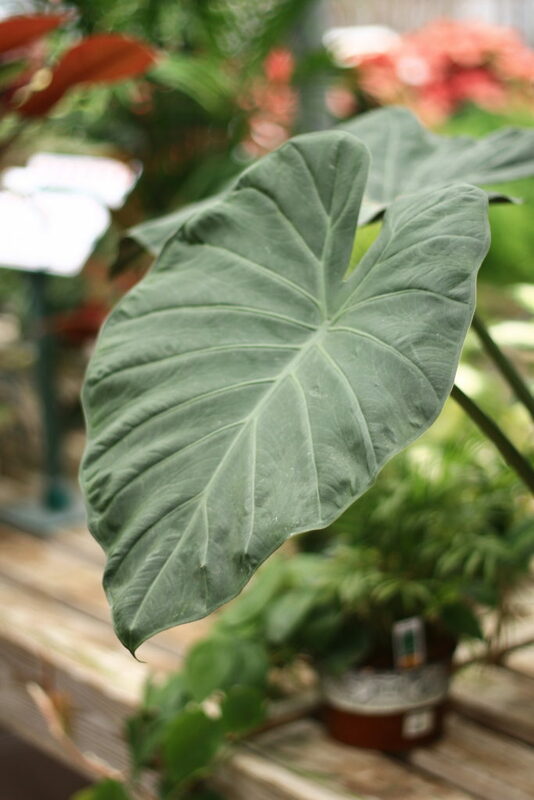 It includes different types of monsteras, the heart shaped philodendron (above), and the elephant ear plant (below), as the most common. Part of the Araceae family, they are considered toxic, but less than its siblings, the Calla Lily and Dieffenbachia. These two plants are more poisonous in general on the toxic scale, so I recommend avoiding them. Monsteras are only toxic in excess, causing stinging around the mouth and stomach upset if consumed consistently. 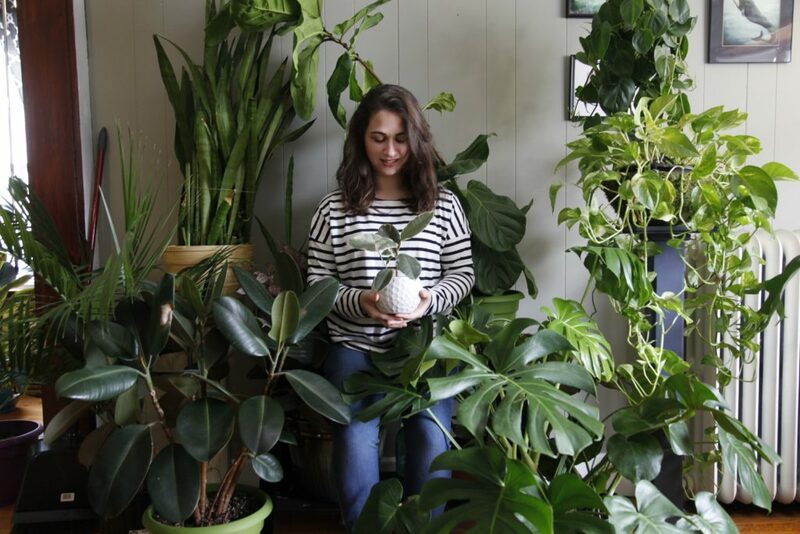 In my Ficus Elastica post, I came across this similar situation – I have quite a few plants that are toxic to animals and I’ll explain why I do. The main reason is leaf size. My cats, and it seems cats in general, fancy stringy, grass-like leaves that are easily chewable – like palms and spider plants. I have never had a problem with cats or dogs chewing, or even showing interest in large leaf plants, since they seem more like furniture than a salad. 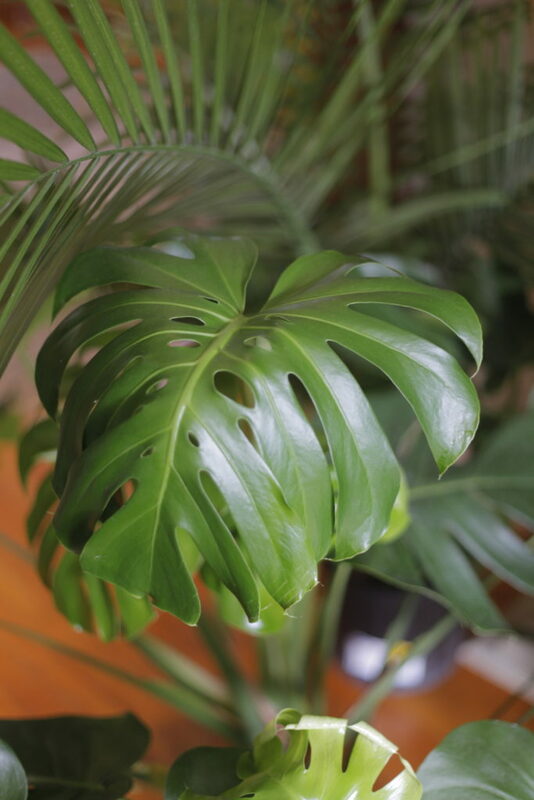 The Monstera Deliciosa is no exception with its plasticky leaves’ average size being 10″ in diameter. Honestly, leaf size is the key. So, to those wondering if it is ok to get one of these beauties, I say yes, as long as your pets aren’t destructive-consuming-plant-vacuums. In the end, you are the only one who knows your pet. Monsteras are super easy to take care of. Plant them in well draining, high quality soil, with plenty of perlite and rocks. The soil mix should stay relatively moist in all seasons, and you should only water when the top 1/2 of the soil is dry. As far as light – Monsteras aren’t too picky, but, like all plants, they enjoy a decent amount of filtered light and humidity. Monty is still in the plastic pot he came in and he seems just peachy. The photo below is when I first got him (plastic brontosaurus for scale), and the first picture in this post is his size now. Sniff, I’m so proud. Want to learn more? Well, a year later (now February 2018), I’ve propagated more Montys! Interested in how to do it yourself? Read my new post now. Great article – makes me feel better about accidentally buying a monstera for a friend who owns a cat! Question – Their cat doesn’t bother with plants at all (lucky!). However, in having this plant in my bathroom for a couple days while I wait to see my friend (my cat will certainly try eating it), I’ve noticed it dripping water. I read that this is normal, but is that water toxic to cats? I’m positive any cat that sees a drop of water will try to lick it. Hi Dania! The water droplets are transpiration which is totally normal and kind of like people sweating. It shouldn’t happen too much in Monsteras and is usually a sign of overwatering since it needs to release that excess moisture. I wouldn’t say this water is totally safe, especially from a philodendron/monstera, so I would relocate said plant until you no longer see droplets. I hope that helps! I have been wanting to plant a tropical style garden in my yard but have been hesitant due to my dogs we have many other plants in our yard that were already established and they havent been bothered by but whenever i have looked up a plant i would like to add and it just comes up as toxic to pets i have completely avoided it. Hi Jessica – Yes, unless there is some serious munching or consistent nibbling going on you should be fine! Do you know if the water dripping from the leaves (guttation..(?)) is poisonous to cats? My monstera is dripping every morning and is messing upp my floor a bit, but I’m more concerned for my cats and if they lick the water.. I have googled but not found anything about it. Is it just plain water or does the plant release something toxic in it? Hope you can help! Hi Ebba, I would think it’s not toxic, as it’s just a form of condensation but I’m not 100% sure. 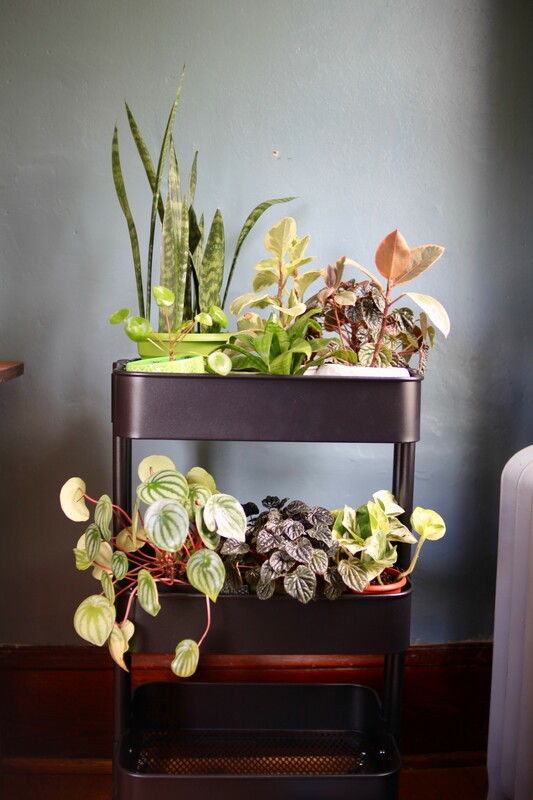 Depending on the size of your monstera, I would put a tray or those plastic things that go under pots to collect the water, and place it on a plant stand. That should help the cat and water destroying floor situation. I hope that helps! Glad I can help Shannon! Claude is the best name! Yes, just monitor your cats and watch for chewing – kittens are notorious for getting into and eating everything. It may help to put Claude on a tall plant stand until your kitties get a bit older too. I’ve found that helps with kittens. Yes my experience confirms what you say. I tried chewing some of my mature tough Monstera deliciosa leaves to see if they have that “pins and needles” effect in the mouth like I’ve experienced with raw taro and other relatives ( I carefully spat it out and rinsed my mouth after a few minutes)… little or no detectable effect on inside of mouth ( it’s possible young tender leaves are higher in toxins to deter browsing but I didn’t have any available to test). I was thinking of planting this as part of a hedgerow against goats since they are not stupid and don’t eat the related Arum Lily (Zantedeschia aethiopica) which is wild around here. On the basis of this trial I doubt this would be very goat proof despite many reports on the net & in books they contain calcium oxalate crystals. I love this post! I too have some toxic plants, but my cats don’t really show much interest. 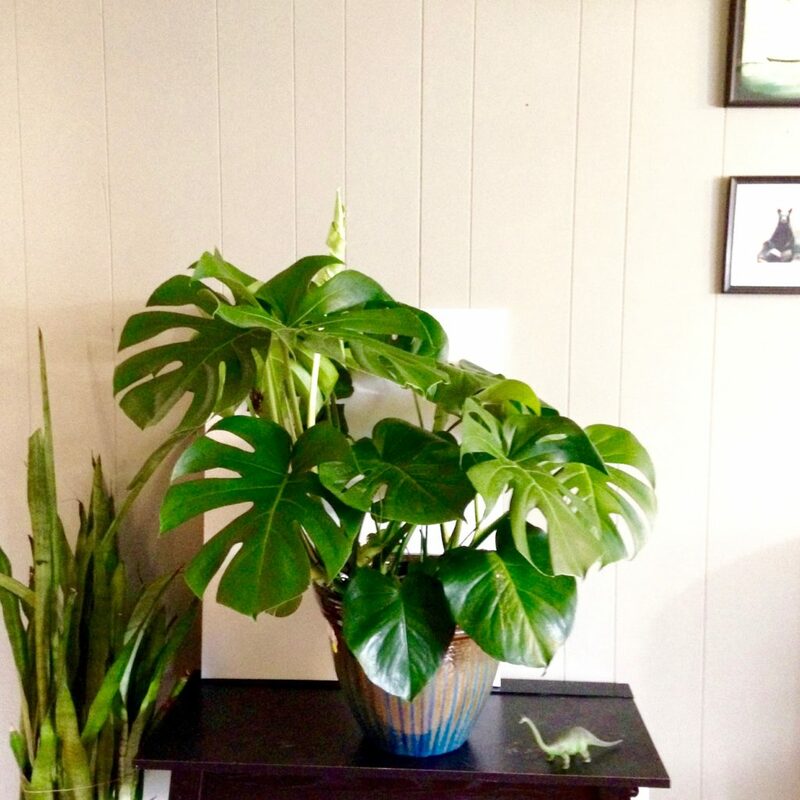 I have been keeping my monstera up high, but eventually it will get heavy and need to be on the ground. Your posts are lovely! Funny thing about monsteras and many other plants of their ilk — they’re considered “toxic” because of insoluble calcium oxalate crystals. These crystals are not poisonous, which is what I think most people picture when they hear the word “toxic,” though they *are* extremely irritating (the crystals are tiny and very poky). An animal that tries to ingest one is not likely to eat much of it, and probably won’t make the same mistake twice! Like you said, it’s mostly a thing of excess. I can’t fault people for exercising an abundance of caution, though. It’s hard to see a pet in distress.